Brightest lights, biggest stage, highest stakes. These are the moments you live for in sports, especially as an athlete. 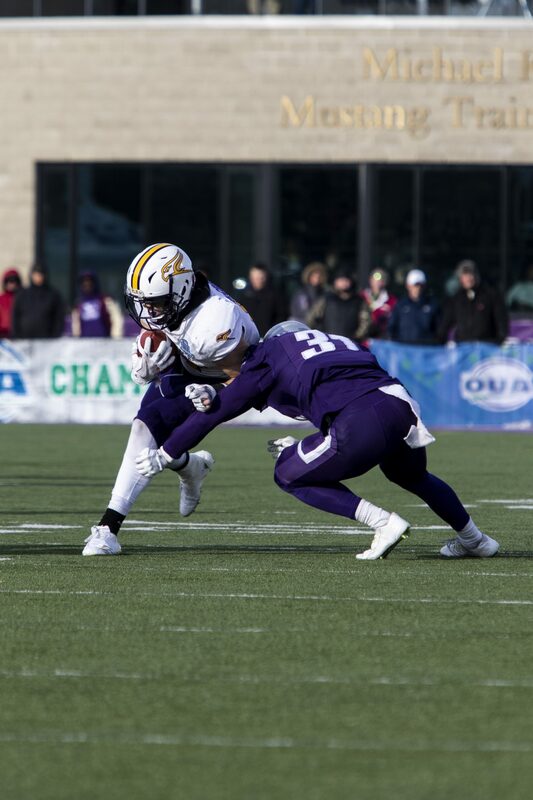 In the biggest game of the year, with their season on the line, the Laurier Golden Hawks took their biggest loss of the year against the number one ranked Western Mustangs, 46-13. Western having not lost a game since the 2016 Yates Cup game versus Laurier, were the clear favourites in this one — but there was a strong belief on the Laurier side regardless of the doubt from outside the team. This game started out tight, as Laurier’s defence played Western’s ground game better than any other opponent has managed to do this year. “Well the biggest thing in us being in the game early on was the defence. They created turnovers, they really slowed down Western’s run, and with the weather, they gave us great field position on offence,” coach Faulds said. Going into the second quarter with the score being 7-6 for the Mustangs, there was a severe weather delay due to lightning in the area. Following that, Western scored 10 straight points to go up 11. Laurier came through with an answer on a wild turn of events. After a questionable turnover on downs call where it seemed quarterback Connor Carusello crossed the goal-line on a quarterback sneak, Mustangs running back Cedric Joseph fumbled it at the one-yard line on the next play and Hawks defensive back Malcolm Thompson recovered it. Carusello redeemed himself quickly delivering a touchdown pass to Brentyn Hall to make it 17-13 going into halftime. The second half turned out to be nothing pretty as nothing happened for Laurier and Western scored 29 unanswered (21 in the fourth), to run away with this one and holding onto their undefeated streak. “In the second half, we just really couldn’t get anything going offensively. That was the challenge. Kudos to Western, they have a really good defence but we would’ve liked to have been able to be more productive on offence and move the ball,” coach Faulds stated. Following two straight Yates Cup game appearances and winning one of them, this was not the season anybody, including the team itself expected this year. “Ultimately, it’s a disappointing year. There’s no sugar-coating it. We’re not pleased that we’re out right now. The reality is, our goals and aspirations and where we’ve been over the last few years, it’s trying to win a Yates Cup at the very least. Having had a chance to beat Western on Oct. 20, whether we had a chance now or in three weeks at the Yates Cup, we weren’t able to get it done,” expressed Coach Faulds. Missing the playoffs for the first time since 2013, it will be back to the drawing board as the Hawks will be looking to find their way back into being the contenders they once were.